The Custom Closet Company expertly designs custom closet and storage solutions for your home office. 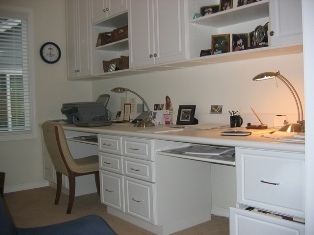 If you are looking to convert a spare room into a home office, want to update an existing one, or need to organize existing clutter, The Custom Closet Company can address all of your home office storage needs. Utilizing interior design and installation solutions, The Custom Closet Company, will open up new and functional space in your existing office. Are you tired of losing important papers on a cluttered desk? Would you like place for reference books that's accessible yet out of the way? Don't waste any more time stressing you home office organization, let The Custom Closet Company take control of it. Just tell your team from The Custom Closet Company what your home office needs are and well devise and install the perfect home office upgrade. We will give you a free in-home estimate on the perfect solution for your home office.